Christina's World is a work by U.S. painter Andrew Wyeth, and one of the best-known American paintings of the middle 20th century. It depicts a seemingly young woman lying on the ground in a treeless, mostly tawny field, looking up at and crawling towards a gray house on the horizon; a barn and various other small outbuildings are adjacent to the house. So why did he paint this particular picture? What's the meaning behind it? Wikipedia answered that one for me too. The woman of the painting is Christina Olson (May 3, 1893 - January 27, 1968). She had an undiagnosed muscular deterioration that paralyzed her lower body. 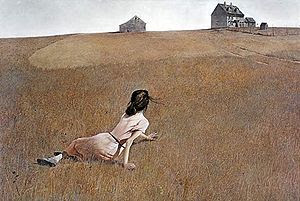 Wyeth was inspired to create the painting when through a window from within the house he saw her crawling across a field. Wyeth had a summer home in the area and was on friendly terms with Olson, using her and her younger brother as the subject of paintings from 1940 to 1968. Although Olson was the inspiration and subject of the painting, she was not the primary model — Wyeth's wife Betsy posed as the torso of the painting. Although the woman in the painting appears young, Olson was 55 at the time Wyeth created the work. The house depicted in the painting is known as the Olson House, and is located in Cushing, Maine. It is open to the public as a part of the Farnsworth Museum complex; it is on the U.S. National Register of Historic Places, and has been restored to match its appearance in the painting. In the painting, Wyeth separated the house from its barn and changed the lay of the land. Painted in 1948, this tempera work, done in a realist style, is currently on display at the Museum of Modern Art in New York, as a part of their permanent collection. I had romanticized the picture by making up my own story about the girl in the artwork. I had decided that she was upset and feeling lost. Pining away for a lost love. Aching for that person to come and rescue her. I read too many romances, huh? But really I think the true story behind the painting (now that I know it) is far better. It's quite sad that she had the disease she did. But it shows courage and perseverance. She made the decision that she was not going to stay inside all day just because she had a disability. She would be out in the world and work with what God had given her. Very strong woman indeed. Has there ever been a piece of artwork that has touched you in such a way? One you just couldn't stop thinking about? Tell me your story. I have never seen that painting before, but I absolutely LOVE it! I want it....that is truly one of those pictures that says 1000 words! Wow, I can see where it would be stuck in your mind. It is beautiful! I love the story behind it too. Can you just imaging having to crawl through that field just to be out and about?